One of the most important objectives of FAR’s Breaking the Cycle of Poverty Program (BCPP) is to encourage youth to participate in positive, service-oriented activities. As part of this, 35 young people – Mardigian Scholarship students from Tavush Province who are supported by BCPP, along with young people from the town of Berd and some neighboring villages—had a memorable visit to Shkhmurad Monastery in Tavush where they demonstrated their appreciation for nature and history on August 24th by performing some maintenance on monastery grounds. Not only did they enjoy it, for almost all of them it was the first opportunity to see this historical site and learn more about it. Built in the 12th century, Shkhmurad Monastery is a timeless cultural and educational center, and a famous pilgrimage site for some. Today, this complex is included on the list of some of the monuments most in need of restoration in Armenia. Only a few residents in the region are aware of its existence, and even fewer about its history. Still, there are some visitors who make the effort to travel to its remote location. The portion of it that is preserved is in poor condition, however. To help fix it up a bit, the kids spent the day clearing the grounds, removing dead trees and branches, and trimming back some of the overgrowth. 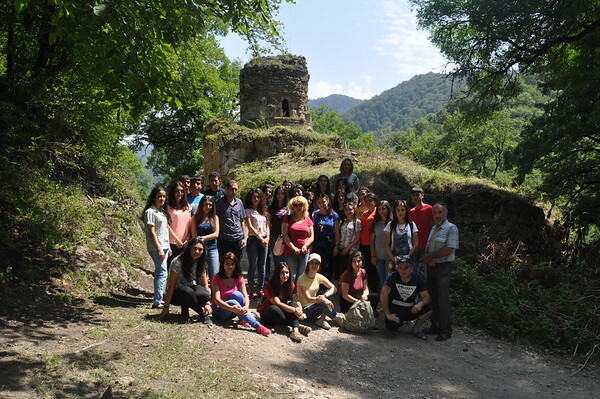 “The young participants were apparently happy with the day spent at Shkhmurad Monastery and are enthusiastic and willing to continue such initiatives,” said Ani Papyan, one of the social workers at FAR’s Berd Office who chaperoned the trip. This summer also marked the openings of the Sunday Schools that operate under the Tavush Diocese of the Armenian Apostolic Church in Navur, Verin Karmiraghbyur and Choratan villages. Within BCPP FAR supports the “One Community, One School” program aimed at diversifying children’s and teenagers’ spare time.